Ramblings of an Impatient Artist: Happy New Year! First off, let me apologize for my lateness, I completely forgot. I know how do you forget to post about something so darn fun - don't ask cause I don't have an answer. Anyway - it's here now there's much happiness now! Now, today is not only the start to a fab new year on the Farm, but it's also our JANUARY RELEASE DAY! This is such a SWEET card.... adorable image! She is a sweet bean indeed.. Happy New Year. Love how you coloured her hair! I think Sweet Bean is SO adorable! I love how you colored her with that no-outline effect. Happy 2014! Wow, your colouring is gorgeous! Incredible colouring skills you showed here! Absolutely adorable card!! Oh my! She is so, so cute! Your coloring is absolutely amazing. Great layout, too. 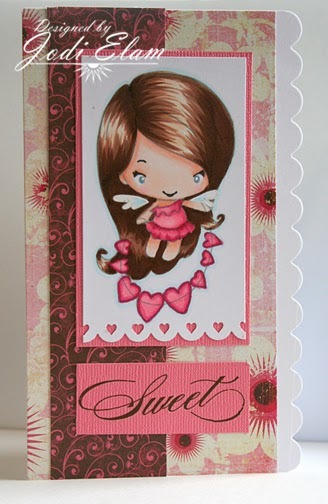 Beautiful card, love the detailing and the color choices! She is so adorable!!! Love how you colored her up & those papers are some of my favorites! Happy new year 2014!!! A lovely card well worth waiting for! ;) Sooo cute!!! Your card was worth waiting for !! Love the Sweet Bean card..Now I have completed the hop and will cross my fingers...As a big TGF fan it would be a dream to win them..but sofar I have never been lucky in the hops. Super adorable card! love the pink! So cute...I'm glad you remembered...haha...thanks! Love the pink!! Cute card! Stunning coloring!! You knocked it out of the park!! Love this little bean!!! Gorgeousness card Jodi !!! So cute! Love your card and the stamp is fab! Loving all the new releases. Thank you for sharing your amazing creations. I love how you colored her without black lines!